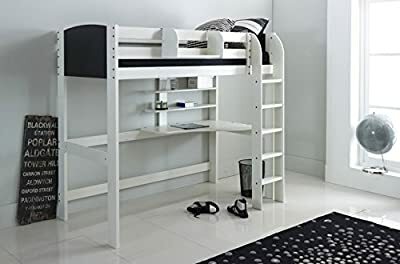 Scallywag Kids High Sleeper Bed - White/Black - Straight Ladder in White - Integral Desk & Shelves. Made In The UK. Product prices and availability are accurate as of 2019-04-24 16:18:59 UTC and are subject to change. Any price and availability information displayed on http://www.amazon.co.uk/ at the time of purchase will apply to the purchase of this product. 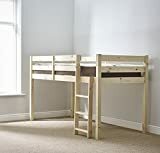 Direct From Leading UK Children's Bed Manufacturer www.scallywagkids.co.uk 196.5cm (Length) x 98cm (Width) x 177cm (Height). Overall width (Inc. Ladder): 110cm Hook On Shelf Not Included. Mattress not included. Click the 'Scallywag Kids' Link (Above) For Our Range of Mattresses Flat Pack For Easy Home Assembly Ladder can be fitted to either the left or right hand side.